Inverted Alchemy: An Integral Economy: Reality…Really? What’s your 12th Sense? On August 17, 2017 the Laser Interferometer Gravitational Wave Observatories (LIGO) in the U.S. and Europe together with 70 ground and space-based systems detected gravitational waves and light from colliding neutron stars. And, assuming our theoretical and sensory models are correct, the U.S. Gemini Observatory, the European Very Large Telescope or VLT (yep, that’s its real name) and the Hubble Space Telescope all detected the synthesis of gold and platinum. Conveniently named GW170817 for the date of its detection, this event was triangulated through observations made in Hanford, Washington; Livingston, Louisiana; and, Pisa, Italy. The way that the gravitational wave is detected is by sending a laser beam down a very long tunnel to a suspended mirror. If the light comes back in a different location, something jiggled. This jiggle was from a portion of space about 130 million light-years away from Earth. After triangulating the source of the jiggle, other physicists trained their instruments on the location and picked up x-rays, ultraviolet, optical, infrared and radio-waves. …which it doesn’t. Element 79 on the periodic table is an obsession for numerous reasons. There are those who would suggest that humanity’s affinity for and obsession with gold has something to do with its ability to serve as a venerable metaphor for the Sun in malleable form. Others celebrate its paradoxical attribute of being an excellent reflector of infrared albeit capable of conducting the electromagnetic spectrum when in direct circuit. And while gold synthesis is thought to occur in the collision of neutron stars and has actually been synthesized by bombarding mercury (and platinum) with neutrons, the stories of how gold actually showed up on the planet is the stuff of myth. According to the generally held narrative, most of the gold on Earth is in the Earth’s core. The stuff that you wear, invest in, and use was delivered to Earth by asteroid impacts about 4 billion years ago. Now there will be those who say that the value of this ‘basic science’ is justified to help us understand the ‘origin’ of the Universe. But as time is a theoretical construct in and of itself, even this pursuit is a self-reinforcing hypothesis. Things must have a beginning. Why? Because our linear time construct says that they must. But we choose the operating narrative that tells us that there must be a ‘beginning’ and then look for ways to reinforce the correctness of our observations through ‘data’ and ‘technology’. But we do not, for a moment, contemplate the possibility that Einstein, Newton, Buddha, Confucius and others were informed by culturally accepted normative senses and then back their ontologies into them. In our common narrative of reality, we apprehend the world around us through 5 classic senses. This notion – known to be dominant since the Katha Upanishad recorded in the 6th century BCE – suggested that the body was a chariot drawn by 5 horses with the mind as the ‘charioteer’. These senses – touch, taste, smell, sight, and sound – are each derived from and modulated through cranial nerves. 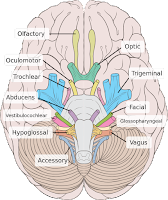 Cranial nerves are the ones that are directly wired into the brain. Ironically, we have 12 – not 5 – cranial nerves. Which begs two questions. First, why have the other 7 nerves not gotten status as a fundamental sense? And second, given the interaction of many of the cranial nerves, how is that we don’t see that sense is a triangulation of impulses – not a single impulse? One could equally argue that we have only one sense – resonance perception – and that how we perceive the world is through the subtle integration of distinguishable dissonance, resonance and coherence. 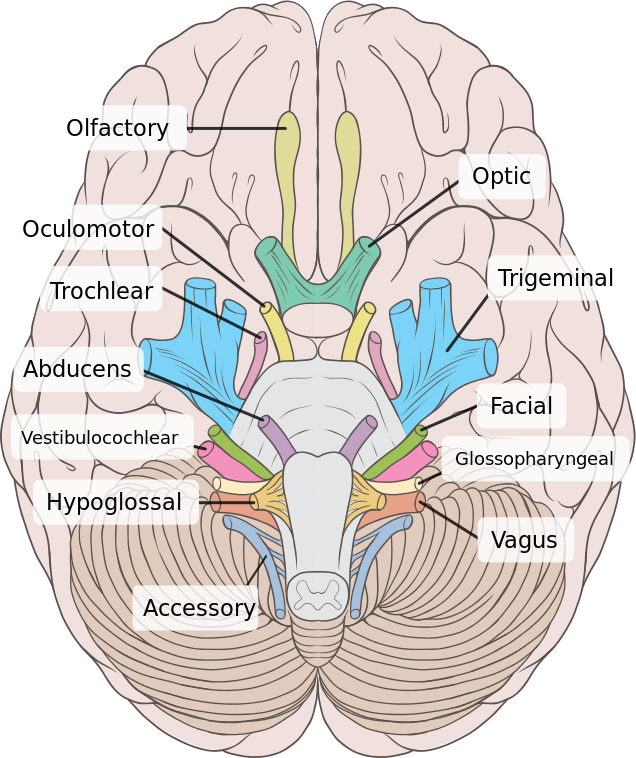 As a quick neural anatomy primer, the following are the 12 cranial nerves in their anatomical order. 7. Facial Nerve – Facial Expression, speaking, chewing, swallowing, salivary function, soundwave modulation. By selecting 5 senses, we reduce the forms of awareness that we can share. And by normalizing a consensus view of the amplitudes and frequencies in which sensation can occur, we exclude as intuitive, psychotic, delusional, or aberrant those who perceive what others either do not or chose to ignore. In short, we constrain the ‘accepted’ senses to ‘normal’ amplitudes, durations, and frequencies and then work to reify our models using these delimited parameters. We define matter by its chemistry failing to appreciate its resonance and dynamism. We define energy based on our observable utility thereof dismissing as immeasurable or unknowable that which falls outside the consensus. Popular spiritual teachers, in an attempt to appeal to a more empathetic and sensitive social order, have further denigrated the complex resonance receptor that is the whole of the body and its field by instructing people to “get out of your head and into your heart.” This admonition physiologically, energetically, and metaphorically seeks to limit the analytic in favor of the empathetic. Tragically, neither science nor spirituality is encouraging us to get MORE in our heads, hearts, ganglia, and corpuscles. Expand our aperture. Sense more. Why? The answer is simple. If humans are conditioned to reflexive response in a consensus range of social acceptability, mass consumption (everything from stuff to ideas) becomes easier. By marginalizing an expanded range, those who perceive differently are ostracized. While we spend billions of dollars confirming our theoretical constructs of illusions that we have projected on the Universe we cannot contemplate the extra-quantum potential of a neutron star collision altering our social valence. For me, August 17, 2017 was a red-letter day. On that day, I sat on the beach in Maalifushi, Maldives describing the religious and social constructs that created the energetic obstacles to my life over the preceding 50 years. While neutron stars were colliding and synthesizing (or not) novel dense compounds a million parsecs away, here on Earth, I was synthesizing something of inestimable value – a personal narrative that allowed me to access a tranquility heretofore unknown to me. Besides the sunburn and the conversation of August 17, did my lucidity come from a gamma ray stimulus that emerged with a gravitational wave jiggle? Who knows. But what I know is that I accessed something of far greater value than I could have ever imagined. What made August 17 the day for my epiphany? Who knows. But I like to think that it was my sensitivity to the extragalactic collision. In a world awash in a race towards autonomous, augmented, or virtual reality, I would like to ask us all to pause and consider the consequence of the sensory reductionism that is currently attendant these impulses. Do we have confidence that the programmers and engineers are those who represent the widest amplitude, deepest humanity perceptives? Do we know the wavelength, amplitude, and operational constraints built into the sensors and simulators that animate our world? Are any of us asking the human questions about the implications of a society served on 450, 800, 1800, or 1900 MHz? Do we understand what can and cannot be transmitted on ITU frequencies? Do most of us even know what this question refers to? We have a hunch that the social systems and their technological companions and henchmen are fundamentally compromising much of what we value. We’re pretty sure that we’re being taken for a ride with some sort of Orwellian dystopia. But we’re complicit if we continue to fall for the illusion of the advantage of digitizing the analog human existence. Maybe you reading this post, maybe your sharing of it, may create a gravitational wave. Maybe a mirror at the end of a long tunnel will jiggle. And just maybe, we’ll see things in a different light. Wouldn’t that taste amazing?